To other dishes. The king prawns in a dish of stir-fried prawns with spring onions and ginger (£11) was delectable. 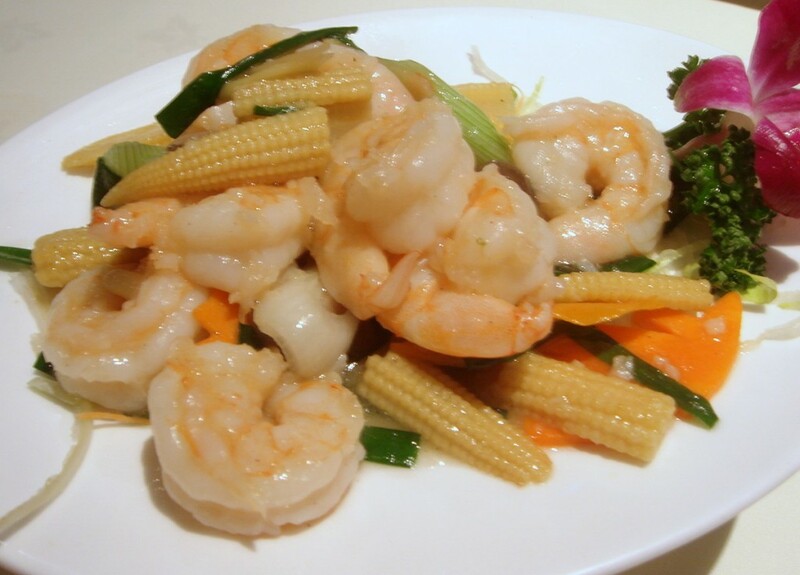 The prawns were firm, with a crunchy bite to them in the way that Cantonese people like prawns to be cooked. The sauce was very pleasant. 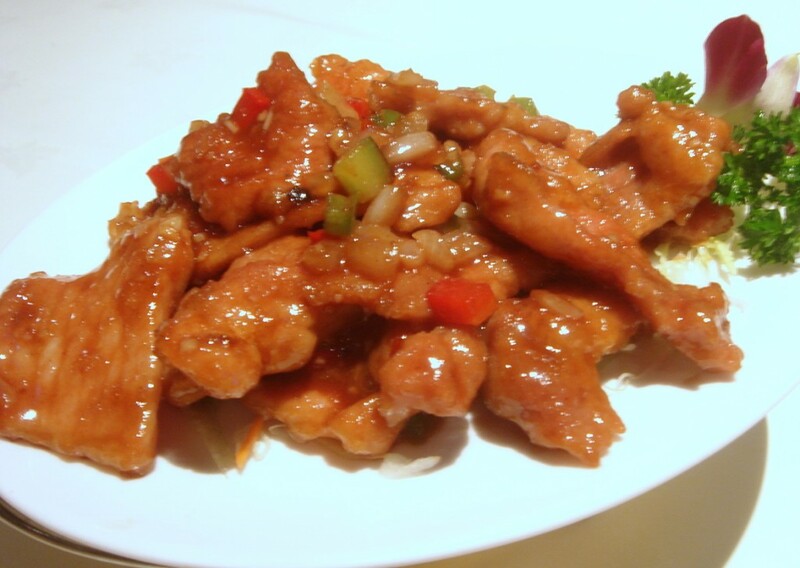 A dish of sauteed pork chops in plum sauce (£8) was enjoyed by all. The pork was resoundingly tender and the sauce was not too sweet with a hint of spiciness from the little bits of chilli in it. An assorted special seafood hot pot (£35) containing sea cucumber, abalone, fish maws, prawns, scallops, squid and Chinese mushrooms with oyster sauce was very tasty. The prawns were again the highlight with a wonderful crunchiness to them, and with its good assortment of seafood, this was one of those delightfully comforting Chinese dishes. What I would say was that we were hard pressed to find any abalone. We even asked the kitchen if the dish in fact contained any. The restaurant insisted that there was some, although they must have been cut so small as to be virtually non-existent. At £35 we all felt that this was dish was very overpriced. The pricing obviously took into account how expensive abalone is, but seeing as we didn’t really think we ate any, we would have preferred no abalone at all and being charged less. Mrs M also highly recommended the black sesame dumplings (£4.30 for a portion of four) for dessert and I was taken aback by how luscious these were. These are little balls made from rice paste, filled with a sweetened powder made from ground black sesame and coated on the outside with a mixture of finely grounded cashew nuts and coconut. Served warm, there was a beautiful aromatic taste from both the nuts and the sesame. 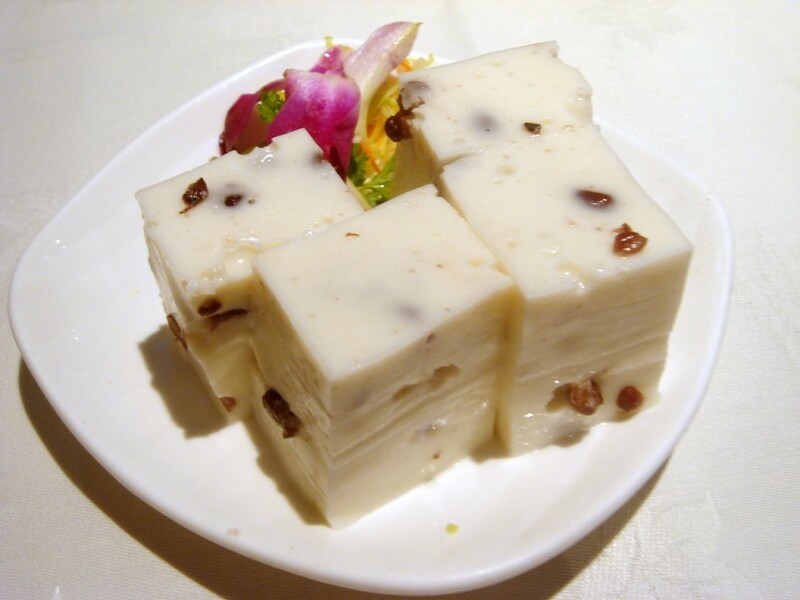 The dough from the rice paste was also light and airy. Being quite a typical Chinese dessert, it might not suit certain palates, but this version of the black sesame dumpling is probably one of the best I’ve ever tasted. We were also given some red bean puddings for free. Made from sugar, red beans and coconut milk, these were also very good and authentic. 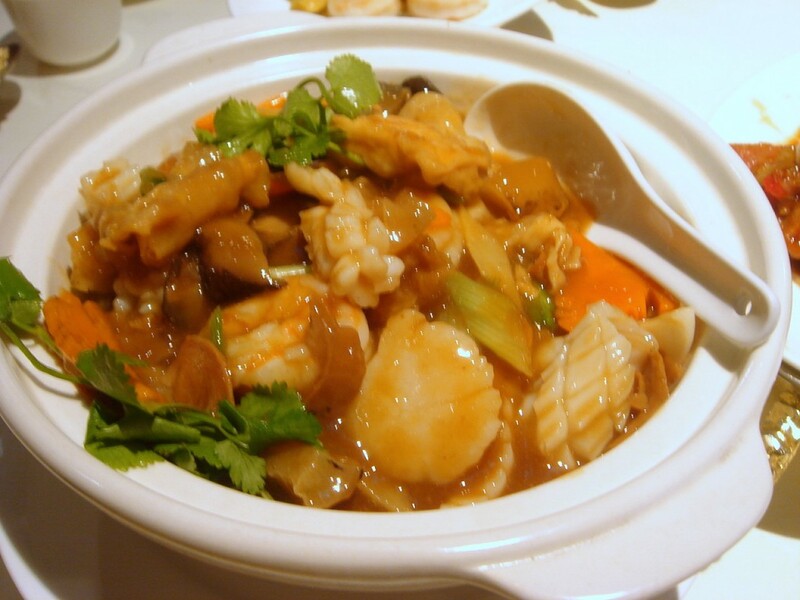 I was impressed with the food at Royal China Putney, even though the seafood hot pot was overpriced. Although not mind blowing, it is traditional Chinese done very well. The chef has a deft touch with the wok and the food is cooked with care. That said, the restaurant doesn’t have much ambience to speak off. The décor is dated – it’s all black lacquer decorated with flying birds – and the restaurant looks like it hasn’t been refurbished in a while. The service was good enough, although I would have liked the waiting staff to have filled up our tea pot more regularly. This is no Hakkasan – there is nothing glamorous about this restaurant. But they do have some very good dishes, including some fabulous lobster noodles which are worth trying if you’re a diehard fan of this dish. 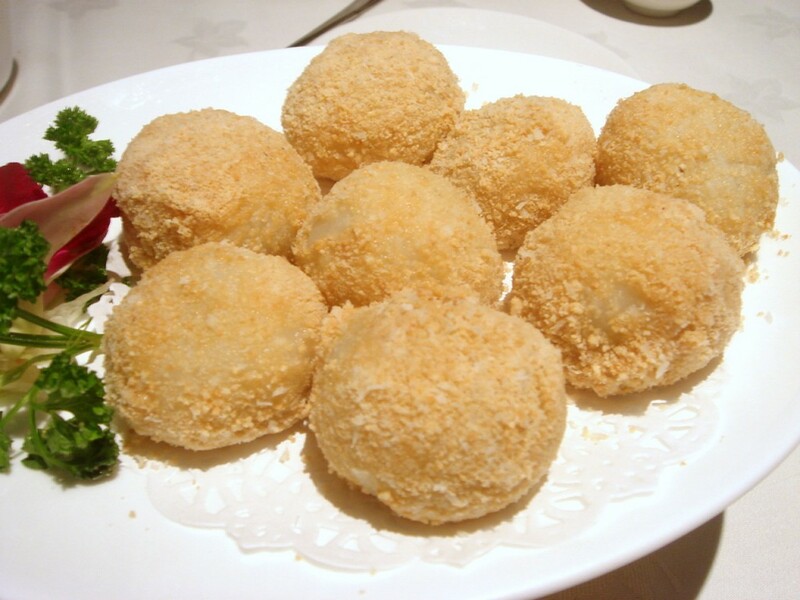 Please note that the Royal China Putney also serves dim sum which this blogger might cover at some other point. Prices: Main dishes start from £8. What an opulent dinner ! 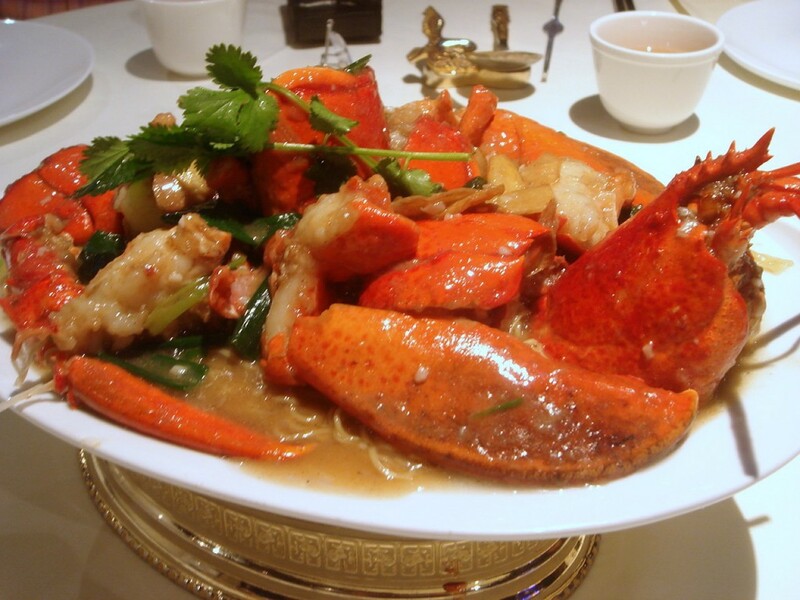 Lobster noodles and seafood hotpot ! I’ve not been here in years but I do remember the dim sum being decent. Yes this was indeed a very Chinese meal! Those sesame dumplings were delicious. Sounds like I will have to head to Putney I assumed that the Royal China there would be very similar to the Bayswater one. Ah if you go back, try the black pepper beef with enoki mushrooms, one of the best versions I’ve tried so far. Yes I didn’t realise until recently that it was separate to the rest either. No Chinese meals for me this week, but if the snow clears I’m heading to Cartmel for Sunday lunch at L’Enclume. Have a great Christmas and New Year. Best regards. I hope your interest in the Royal China was ‘spurred’ by your friend, not ‘spurned’. Sorry if I seem pedantic, but it is a rather nice place and I hope it isn’t spurned by anyone. thanks for picking up the typo. It’s really hard to spot all your own mistakes when you write. I in addition to my pals were checking the excellent tips located on the blog and quickly I got an awful suspicion I never expressed respect to the web blog owner for them. Most of the young boys came totally very interested to read through them and have absolutely been loving these things. Thank you for genuinely really accommodating and then for obtaining this kind of amazing topics most people are really eager to discover. Our own sincere regret for not saying thanks to sooner.